The Teenage Mutant Ninja Turtles (TMNT) toys made their first appearance in the late 1980s and were based on the popular ninja turtle characters from mirage comics. Over the years, the ninja turtle action figures have undergone several improvements and additions and now come in different avatars in the market. Films and cartoon series based on these characters have served to further enhance the popularity of the TMNT toys. Today, apart from action figures, many of the accessories and vehicles used by the ninja turtle characters have also been adapted in the form of toys giving you a large variety of items to choose from. These toys carry you into the adventurous world of Raph, Donnie, Leo and Mikey as they fight the villains so you can relive the drama yourself. We have reviewed here the ten best ninja turtle toys in the market. Read ahead to find out how exciting these ninja turtle toys are and choose your pick. Get hold of the Micro Mutant Sweeper Ops Deluxe and start sweeping all the baddies from the streets and deposit them into the cellar in this vehicle’s interior with the help of a conveyor belt. This vehicle comes with three interesting TMNT characters. Leo and Mike who are portrayed as city workers and the villain Snakeweed to enliven the atmosphere and give a realistic feel. However, a surprise awaits you, for the trailer of the sweeper opens up to reveal the secret workstation of the ninja turtles where you would find a drawbridge and a ramp neatly tucked away. Together with its rotating sweeping feature and moving conveyor belt, the action and fun never stop with the mutant sweeper. See more information on Micro Mutant Sweeper Ops Deluxe. Rotating sweeper and moving conveyor belt. The Micro Mutant Sweeper Ops Deluxe is the best overall on our list. 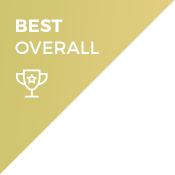 It certainly deserves the honours for its standout features and a complex design. 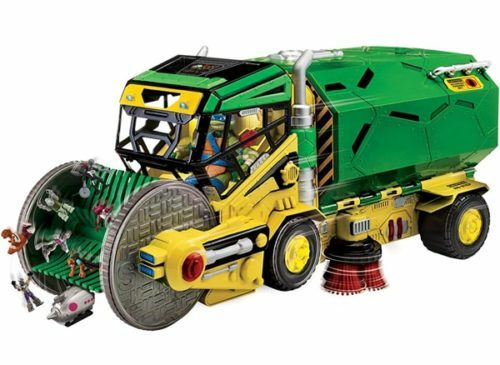 Apart from the three exciting characters included in this vehicle, you can also add to the sweeper other TMNT action figures to intensify the action and drama and create your mutant ninja world. This ninja turtle toy is certainly worth going for. Steal a peek into live action with this ninja turtle toy where Leo and Raph are battling it out with Shredder and a foot soldier who have invaded their sewer hideout. The Mega Blocks Teenage Mutant Ninja Turtles Sewer Hideout Construction Set is the best premium ninja turtle toy on our list and is suitable for ages 6 and above. This toy set has customisable area for each of the ninja turtles and comes along with 4 TMNT characters. Providing complexity to the design are a waterslide, skate ramp, retractable zip line, a computer work station, a DJ table and a revolving wall with a Katana hidden inside. To add some vibrancy to the turtle’s hideout, the structure is equipped with shock sensor -activated LED lights and sounds. 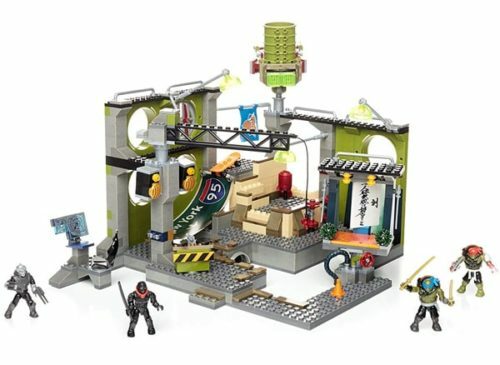 See more information on Mega Blocks Teenage Mutant Ninja Turtles Sewer Hideout Construction Set. Comes with 4 TMNT characters. Flashing LED lights and sound. Being the best premium ninja turtle toy set, this ninja turtle toy justifies the price with its design and the interesting story it tries to weave around it. We get a very elaborate view of their turtle’s den and if you can add a few more action figures from the TMNT series in the setting, this hideout will turn out to be an action-packed battle adventure. The third on out list and the best value ninja turtle toy is the Michelangelo Basic figure, the youngest and most fun loving of the 4 leading TNMT characters. The figure is based on the Michelangelo character from the 2018 Rise of the Teenage Mutant Ninja Turtle T.V series. The design depicts him wearing his trademark orange mask and is accompanied by a range of his favourite weapons: Kusari fundo weapon, iron-fist weapon, 3-piece staff, a skateboard, 2 throwing stars and a graffiti sticker sheet. The action figure stands at 4.25” and looks really cute and is intended for children of age group of 3 to 10 years. 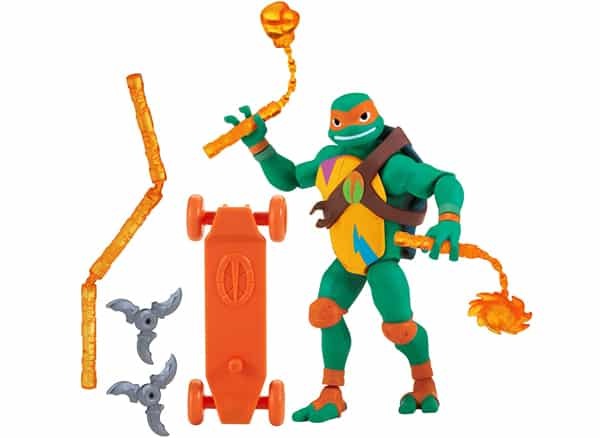 See more information on Ninja Turtles Michelangelo Basic Figure. Design based on latest TV series. Although intended for an age group of 3 to 10 years, any TMNT fan would want to get hold of this toy. It is so good. Although super low on price, it has a host of accessories that come with the primary action figure. These weapons would really set your favourite turtle up for an exciting action adventure. With its miniature size it would be cute little addition to your favourite ninja turtle collection. If you are a fan kid of the TMNT toys, then it’s time to check out this product – literally. We are talking of Ninja Turtles Kids’ Digital Watch which looks really cool and will ensure you are always on time. 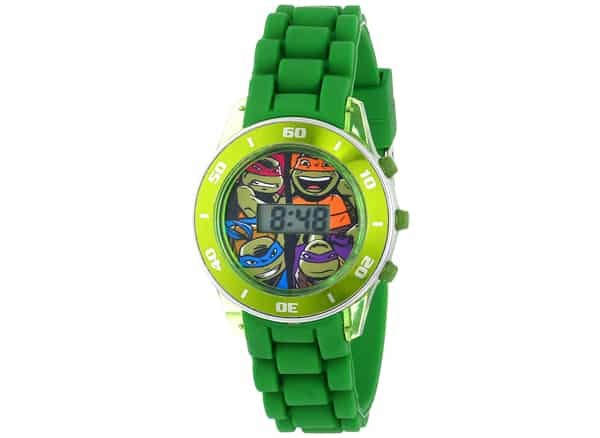 It depicts your favourite ninja turtles: Raph, Donnie, Leo and Mike on the dial. Your dial will also give a colourful play of flashing LED lights at the press of a button. See more information on Ninja Turtles Kids’ Digital Watch. This is watch is a must have in their collection for any TMNT fan kid, for it is the official ninja watch brought out by Nickelodeon. With the attractive green colour and flashing LED lights, it would be real fun to wear and move around with this accessory sitting comfortably on your wrists. 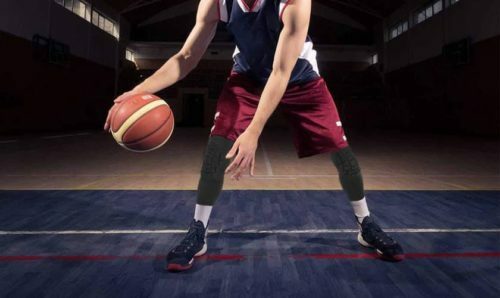 It comes at a very affordable price and there’s absolutely no need to think twice to get hold of this product. Walkie talkies designed like turtle faces of two endearing TMNT characters, Raph and Leo these make for great ninja turtle toys. The characters are identifiable through their trademark red and blue masks and look really exciting. The Teenage Mutant Ninja Turtles Character Walkie Talkies come in a pair and can be used to communicate from a fair distance. 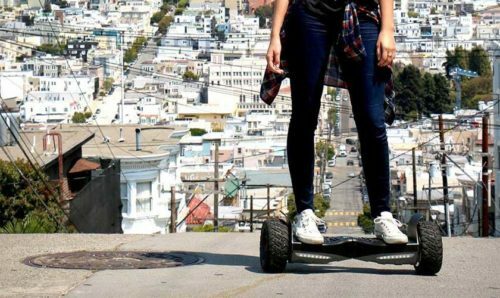 They run on batteries and actually work! Meant for children aged 4 to 15 years, any kid who follows the TMNT series would love to have these. With this in hand you can begin on your secret operation by talking with your fellow turtle on the walkie talkie. 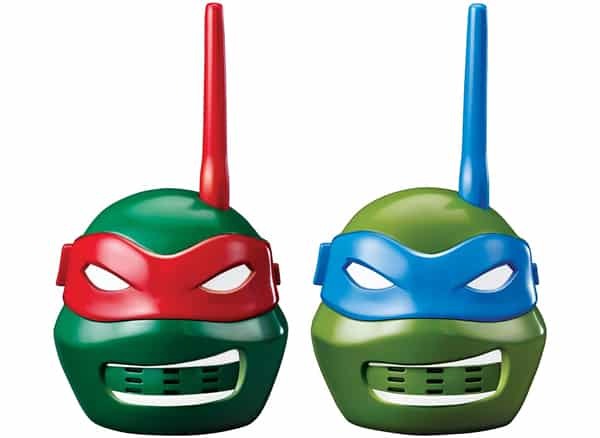 The TMNT walkie talkies would also make for a great gift for any parent to give to their child. See more information on Teenage Mutant Ninja Turtles Character Walkie Talkies. Design based on Raph and Leo. Communication possible from a fair distance. The TMNT Character Walkie Talkies are definitely great product. Although, the sound during communication may not be of top quality, they are anyways not meant to do that. Kids would be able to communicate with each other and have fun. So, they deliver what they promise – to be a good ninja turtle toy. The design, with the two turtles is awesome and even if the walkie talkie stops communicating at some point later, it could still be used as a toy and be added into the kid’s toy collection. Whenever, the ninja turtles set upon an adventure to fight the bad guys, they do so in their amazing vehicles one of which is the Shell Raiser. 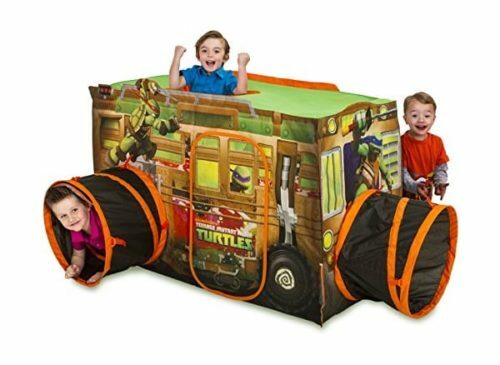 The Playhut TMNT Shell Raiser vehicle is a ninja turtle toy which aims to recreate the magic of the turtle’s adventures so children can have some real fun. See more information on Playhut Teenage Mutant Ninja Turtle Shell Raiser Vehicle. Recreates the Magic of Shell Raiser Vehicle in real life. Cool Designs of popular TMNT characters. Easy to set up and folded down. 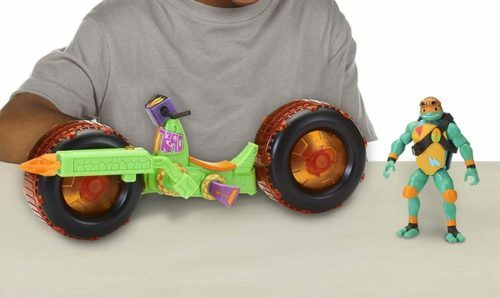 The Playhut TMNT Shell Raiser Vehicle toy is fun product and children would definitely have fun trying to sneak into it and getting out. The inbuilt EZ Twist technology means, setting up the hut or bringing it down is never a hassle. The Ninja turtle designs give the hut a great look and give a real Ninja turtle experience to the kids. Being able to connect the ports to other huts means, the fun will never end. All in all, this is a great product to go for. 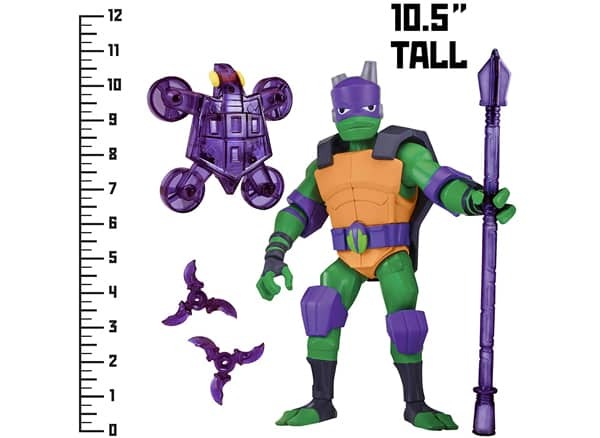 Donatello, the smartest of the four TMNT characters and considered closest to being a ninja master, is here in a giant size with a height of 10.5”. Sporting his trademark purple mask, this ninja turtle toy comes with his Tech Bo staff and two throwing stars to down any of the bad guys in the street. The action figure comes with 13 points of articulation so you can arrange it any battle pose. Reasonably priced, the design of the action figure is based on the 2018 Rise of the Teenage Mutant Ninja Turtles T.V show and is in line with other action figures, vehicles and playsets released by Playmates, based on that popular show. See more information on Rise of the Teenage Mutant Ninja Turtles Donatello Giant Figure. The smartest turtle in the TMNT group. Stand out size of 10.5”. Design based on the latest TMNT series. You would definitely want to bring home the smartest ninja turtle and add to your awesome collection of ninja turtle toys. The giant size would definitely make it stand out and attractive. The weapons are as cool as the action figure itself, and with different poses possible with 13-point articulation, your favourite turtle would be ready for any battle. 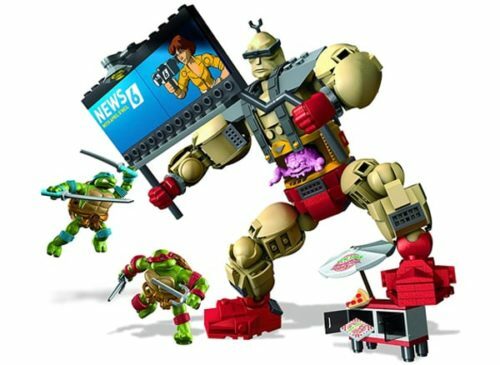 The Mega Bloks TMNT Collectors Krang’s Rampage ninja turtle toy takes you straight into the scene where Raph and Leo are battling it out with Krang robot, which controlled by the evil brain is on a rampage and has even ripped off Channel 6 April O’Neil billboard. The Krang stands out at 8 inches tall and the turtles are micro action figures. Krang’s design is highly detailed and stands in an exciting rampage pose. 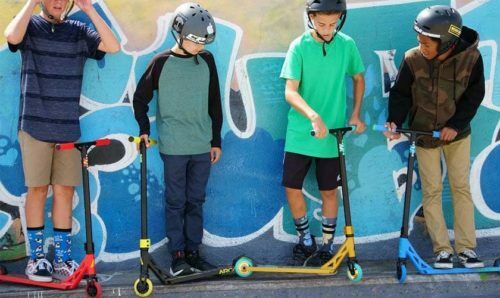 The turtle designs present supreme articulation and come with their trademark weapons, premium metal shell detachable accessories and a manhole cover stand. Due to detailed articulation, the micro action figures are poseable for fighting any battle. The toy is suitable for children between 10 to 15 years. See more information on Mega Bloks Teenage Mutant Ninja Turtles Collectors Krang’s Rampage. Giant sized Krang is a total stand out. Turtle micro Action figures with signature weapons. This is great ninja turtle toy set to add to your mutant collection. It is a buildable toy set and high articulation means the action figures are hyper poseable. Any kid would have really love to sit down and build up the action scene and the giant baddie robot and small turtle heroes make the action drama interesting and challenging. In this action-packed adventurous world of TMNT, there’s certainly no time to rest. But hang on, that might just change. Here is something which you would definitely like to get hold of, The Teenage Mutant Ninja Turtles Patio Chair Toy. Serving the dual purpose of a toy as well as a chair, it is very sturdy for durable use and has a washable surface. What is really likeable about this ninja turtle toy is the four turtle character designs and the signature green colour. 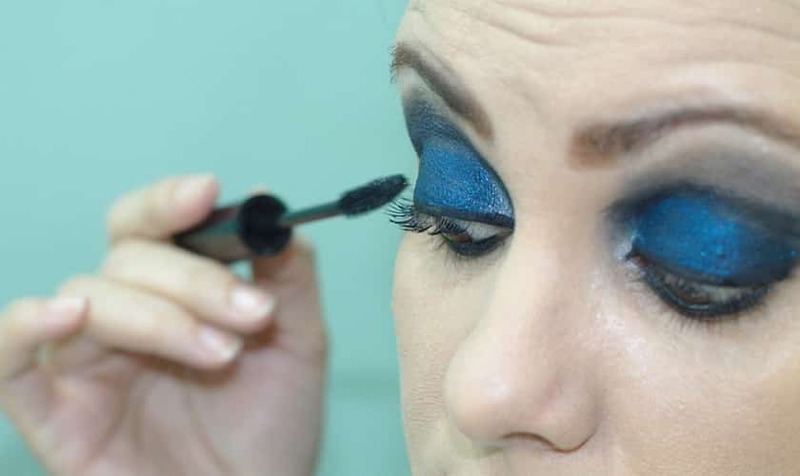 It is convenient to use, and when not needed, can be folded up and stored in a corner. It has been designed for kids aged 3 to 7 years. 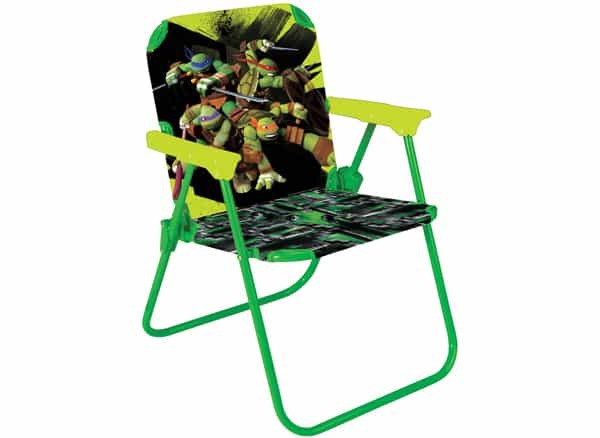 See more information on Teenage Mutant Ninja Turtles Patio Chair Toy. Foldable and convenient to use. The TMNT Patio Chair Toy is a good buy. It will double up as a toy and a durable chair. The little ones would love to sit on it, enjoying their time with the friendly turtles. The exciting graphics and the signature green colour lend the chair a great look. You can definitely go for this. As is often the case with the ninja turtles, the constant companions on their battle adventures are their trademark vehicles. The turtles regularly hop on to their Shell Hog motorcycles and travel through secret tunnels of New York City to fight and defeat the bad guys they meet. 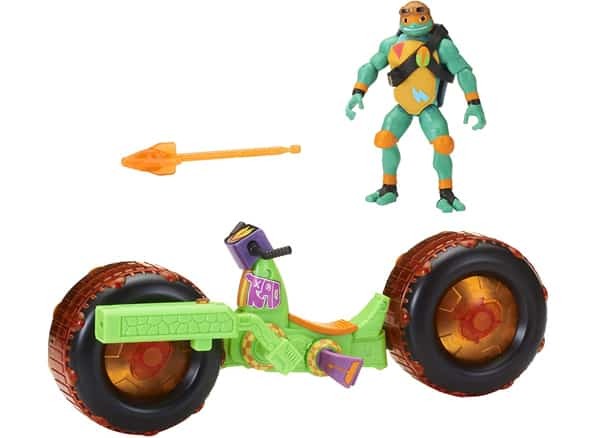 The TMNT Shell Hog with Michel Angelo toy comes with a micro action figure of Mike wearing an orange coloured helmet and the shell hog motorcycle which is projectile launching cycle coming with the W/2 projectile. The individual shell hogs are connectible with other shell hogs for an ultimate turtle attack. See more information on Teenage Mutant Ninja Turtles Shell Hog with Michelangelo. Micro action figure of Michel Angelo. This is a good ninja turtle toy to have to add to your collection of turtle toys. The individual shell hogs are connectible to launch a comprehensive turtle attack on the enemy. When the four turtles join forces, you can be sure it would be an action-packed high intensity drama and villains would never stand a chance. The TMNT toys are quite a rage and they have been in the market since a long time. It all started in the mid-1980s as a comic book series by Mirage Studios and soon the Ninja turtles became very popular and mainstream with miniature figures of the popular characters coming into the market. Leonardo: He is the eldest of the group and the leader as well (in the latest series Raphael is the leader). He is courageous and wears his trademark blue mask. Being the leader, he usually bore the responsibility for the welfare of the others. Raphael: He is the second oldest in the group and the ‘bad guy’ of the lot. He is often depicted as a short-tempered character who doesn’t mind getting into a fight. He wears the red mask and is extremely loyal to his brothers. Donatello: The second youngest in the group, Donatello sports his trademark purple mask. 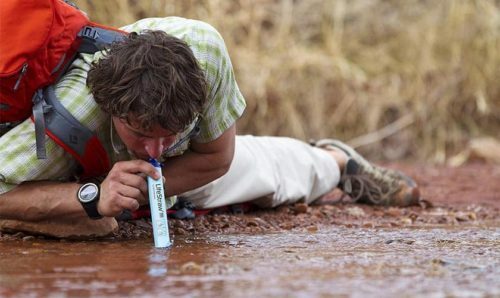 He is the smartest one in the group and a scientist and innovator. Due to his knowledge, he is considered close enough to being a ninja master. His primary weapon is the Bo Staff. Ever since the initial release of the miniature toy figures of the ninja turtle characters in the late 1980s, the toys and merchandise have been around in different avatars. There are T shirts, socks, cups etc. based on these characters. And then there are also toys which are inspired by the characters themselves or their popular accessories or the vehicles used by them. These things help to make the turtles a common household name. The most popular of the lot are of course action figures which come in different sizes from as small as 4 inches to as large as 11 inches in height. They are supremely articulated and detailed so that you can arrange them in different poses to add to the action drama. With each new movie or a cartoon series based on the ninja turtles, one could expect some changes in the designs of these characters and so they have undergone many improvements changes all these years. With every passing film or series you can expect a launch of new characters based on that film. On September 17, 2018 the world witnessed yet another debut of a television series based on the Ninja turtles, The Rise of the Teenage Mutant Ninja Turtles. Its release saw renewed interest in the TMNT toys line and consequently many action figures were released which were inspired from this series. A notable diversion was Raphael and not Leonardo was the leader of the group. The TMNT toys can be very beneficial for kids as the turtle characters have some good qualities like courageousness, loyalty and teamwork. The kids can take inspiration form them and learn skills for life in a fun way. Moreover, it is also a fun way for parents to bond with their kids because, for parents who grew up in the 80s, these toys would bring back memories of their childhood and they can connect easily to the emotions today’s kids would be feeling. All in all the TMNT toys are a great product in today’s market.